Know how you can use DVDFab Ripping software to keep a copy of your movies or music in another device. Break the encryption of any copyright protected disc and get the freedom to use your music or video anywhere you want. Purchasing original music or movie is the way you can support your favorite singer, directory, actor and the whole entertainment industry stay afloat and grow. But this does not mean that you should go by every whim and instruction of them which might result in a loss to you and has no legal means too. Take for instance the use of copyrighted-disc related software which don't allow you to copy the multimedia files from the disc to another disc or on your hard drive. It is perfectly legal to keep a back up of music or video which you bought legally. It is just not legal to distribute these media files to somebody else. So let me introduce you to one premium piece of software that can help you make backup copies of your music or videos from your copyright protected disc. In my review of DVDFab DVD Ripping software, it performed up to my expectations. It has an easy to use interface, solid copyright removal tool and can create copies of your multimedia files without any loss of quality. The only limitation it has is that it doesn't rip Blu-ray discs. For that you need to buy another product. The latest 9.1 version of DVD Ripper software from DVDFab has a modern design that is well compatible with Windows 8 and Windows 10 and has useful functional features. A person who has used even a remotely similar software before will know immediately how to use this software. For others too it will be only a small learning curve. The best thing about this tool is that it doesn't have to download any third party tool to break the copyright encryption that is present on the disc. Normally, the decryption software is already present on the original disc to help you play the multimedia file offline and DVDFab DVD Ripper takes advantage of this loophole to decrypt the media files easily. 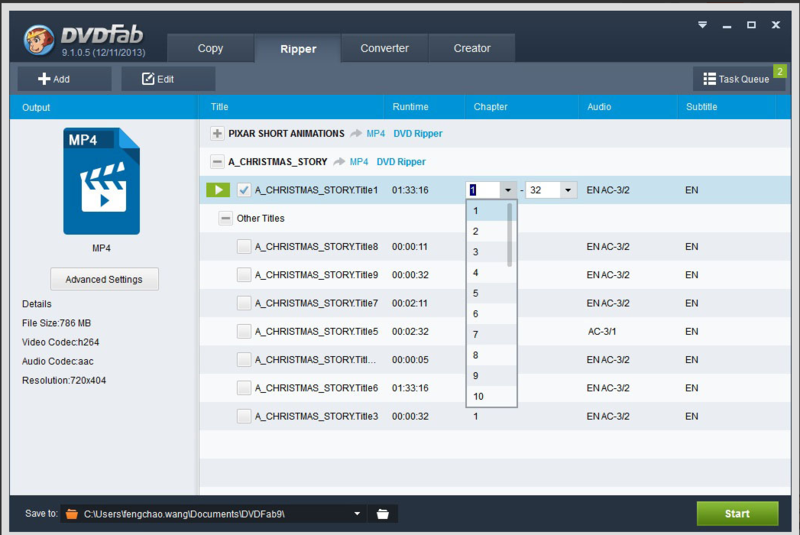 As soon as your system completes reading the disc, DVDFab Ripper automatically decrypts the media files and they are ready to be copied anywhere you want them to. What you want to copy from the disc is also your choice. If you want to copy the whole content from the disc you can do that too otherwise you can choose the copy the main multimedia files only leaving the rest of the files and the cut scenes. The time it takes to copy the files from your DVD has been vastly improved in this latest edition. Earlier it used to take around 1 hour to copy a whole movie; though it is not the longest I have experienced while testing other such ripping software but it was still a hell lot of time. However, now it takes only 2/3rd of that time which is a lot of improvement. It also has a format converting feature for both music and video files which means that while ripping the multimedia files from disc you can specify the format in which you want to save the output files. >DVDFab Ripping software is an easy to use software that helps you protect your investment that you have made buying original music and videos. It has almost everything you need in such a software and this latest version contains speed improvement too. Has everything you need in such a software and uses disc native copyright protection software to decrypt the files to enable them for being copied. Means no internet access is required after successful software installation. Doesn't support Blu-ray ripping. There can be more improvement in the speed of copying front. In this article, you can find a bunch of DVD Rippers trying to find their own way through the competition. Apologies, if the prices are not mentioned (have tried for the ones, for which, we could get). Hope you find this article of some help. Happy reading! Are you looking for a free DVD ripper software? Learn about the features of WinX DVD Ripper software for Windows and Mac. Read this review to learn more about WinX DVD Ripper.